InVia with their fertility treatment. InVia Fertility Specialists is a state-of-the-art Chicago fertility clinic with a strong patient-centered focus. Our highly trained staff understand the importance of maintaining a supportive and comfortable environment for each patient. 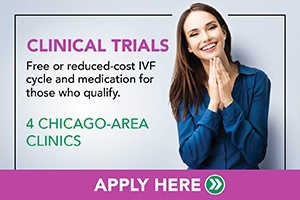 We have four convenient Chicago fertility clinics in the north and northwest suburbs. There we offer a full range of assisted reproductive technologies including non-donor and donor egg IVF, egg freezing, intrauterine (artificial) insemination, pre-implantation genetic diagnosis, assisted zona hatching, intracytoplasmic sperm injection, testicular sperm aspiration, fertility surgery, and more. Our goal is the same as yours; to achieve a timely and successful pregnancy. We are honored to help you in your pathway to pregnancy. InVia Fertility Specialists is proud to be among the first fertility clinics in Illinois to be named a Blue Cross Blue Shield Blue Distinction® Center+ for Fertility Care. Using objective measures developed with input from the medical community and leading accreditation and quality organizations, the Blue Distinction® designation recognizes providers that show expertise in delivering improved patient safety and better health outcomes. Learn more about what this designation means for you.